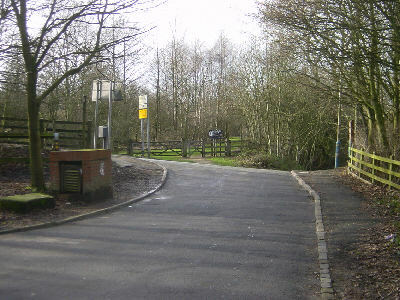 The entrance to the car park at Daisy Nook Country Park was once part of the canal. 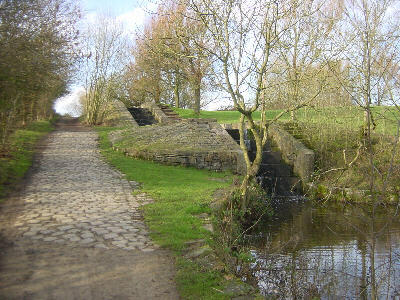 There was a hump-backed bridge which carried Stannybrook Road across the canal. The canal and road could be re-aligned here to create a bridge with a less steep approach and a safer junction with Newmarket Road. 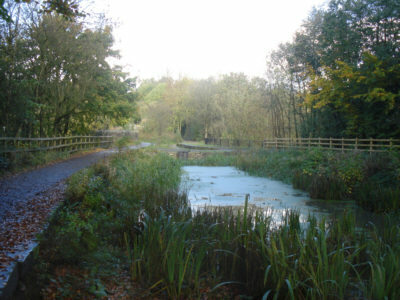 From Stannybrook Road, the canal enters what is now Daisy Nook Country Park. The line of the canal for the first 100 metres or so has become part of the visitors' car park. A restoration of the canal here may involve having to re-site the car park. 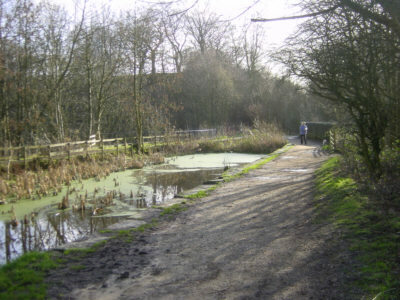 Follow the car park as it curves to the left, following the line of the canal. Looking back to Stannybrook Road from the car park of Daisy Nook Country Park. 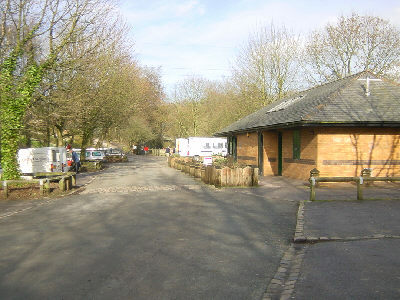 The John Howarth Countryside Centre, which sells drinks and hot snacks, partly on the canal line. Continuing straight ahead through the car park, a short section of the canal is still in water before the entrance to "Dark Tunnel". This was built as a tunnel, but was opened out into a cutting in the 1920s after mining subsidence had caused the tunnel roof to become too low. 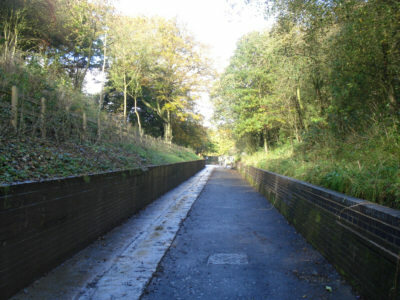 Short section of canal in water between the car park and "Dark Tunnel". Looking south-west along "Dark Tunnel" towards the car park and visitor centre. 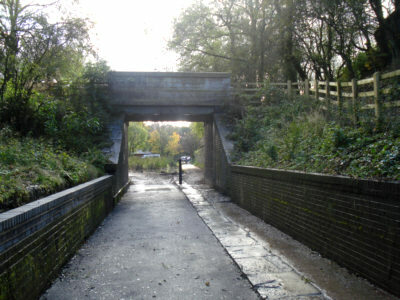 Looking north-east along the opened-out "Dark Tunnel", with the towpath still visble on the left. 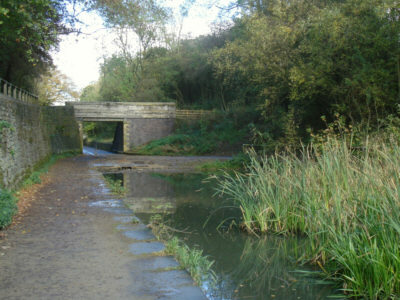 Short stretch of water between "Dark Tunnel" and Waterhouses Aqueduct. 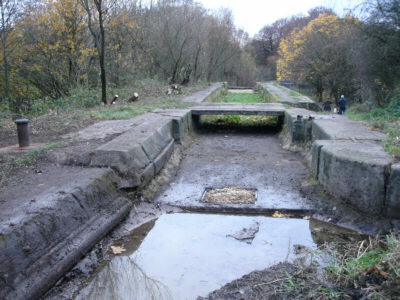 The infilled channel over Waterhouses Aqueduct across the River Medlock. 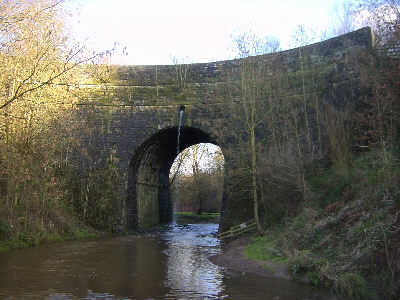 The massive bulk of Waterhouses Aqueduct seen from the River Medlock. 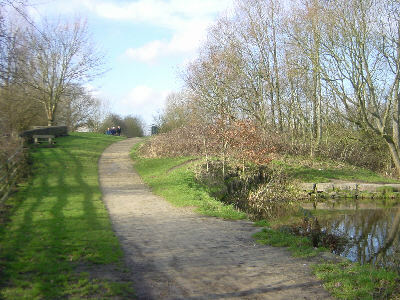 A bridle path uses the infilled canal bed to cross Waterhouses Aqueduct. It would be possible, with some safety precautions, to re-route the bridle path along the bank opposite the towpath. 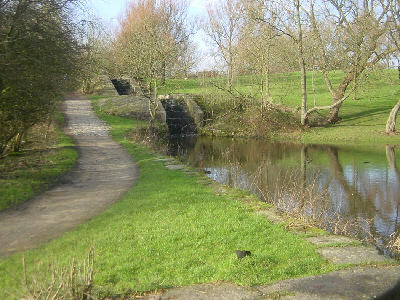 Looking back towards Waterhouses Aqueduct. 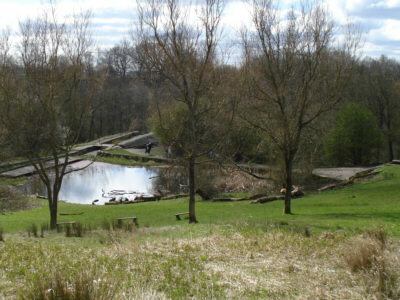 Looking towards Lock 19, the first of the Waterhouses Locks. 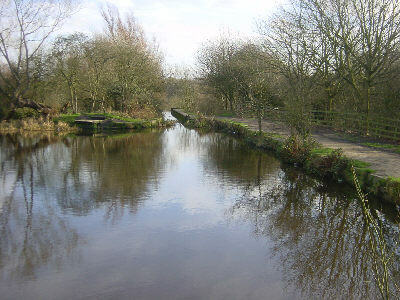 A short distance north of Waterhouses Aqueduct is the first lock on the Hollinwood Branch Canal. The lock chamber has been infilled for safety and vegetation is growing around the tail end of the lock, but the structure appears to be intact. 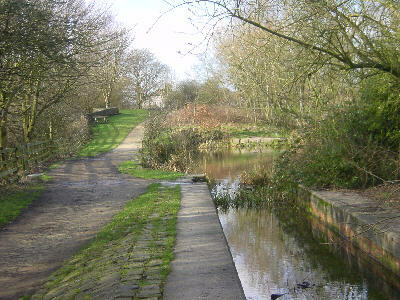 The first lock, just north of Waterhouses Aqueduct, is number 19, following the 18 locks on the Ashton Canal. 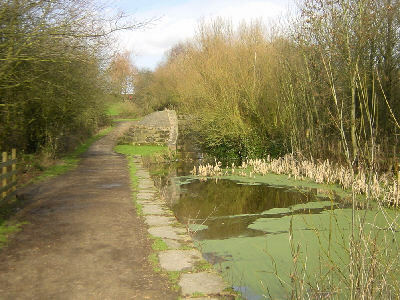 Vegetation has been cut back by volunteers, exposing the stonework of Lock 19. Above the lock is a wide pound. The canal turns sharply to the left and climbs two locks forming a "staircase". This was the only lock staircase lock on a narrow canal in the Pennine area. One lock opened straight into the next, with the middle gate shared by both locks. The locks have been infilled with water cascading down large steps. 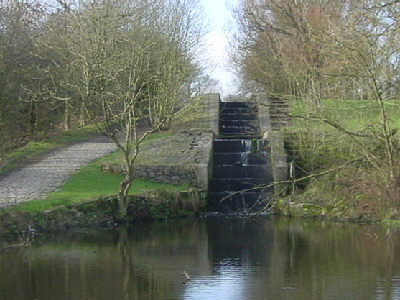 Lock 19, the first of the Waterhouses Locks. The second and third locks form a staircase. Looking back down the lock staircase. Lock 19 is off to the right at the far end of the pond. A metal "A frame" that formed part of the hinge mechanism for the lock gate. Above the lock staircase is another wide pound, used now for fishing. 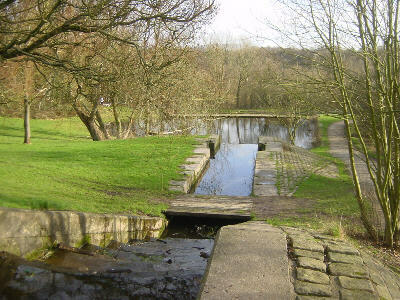 It is known as "Sammy's Basin" after Sammy Pearson, who was the water bailiff for many years. Beyond that is the fourth lock, which has been filled in. 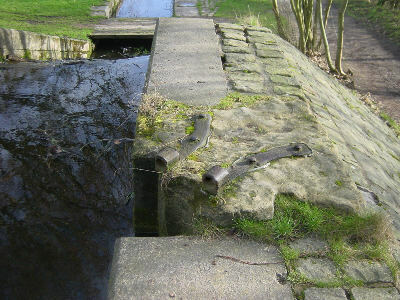 Some of the stonework of the lock can still be seen. Looking from the lock staircase to the in-filled fourth lock. Looking back to the lock staircase across "Sammy's Pool". 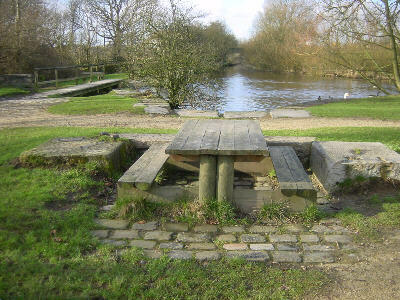 Site of the infilled Lock 22. Stonework visible at the top end of the lock. 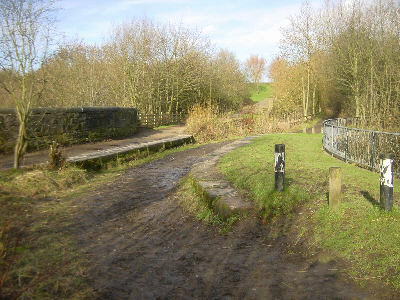 Above this lock is the junction with the Fairbottom Branch, which ran eastwards for about a mile to Bardsley and Fenny Field Bridge. 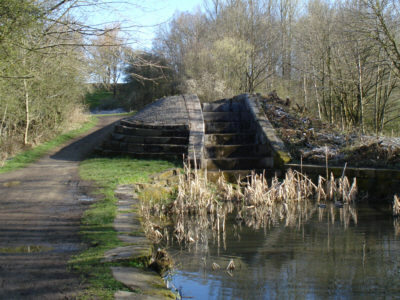 If you are walking the canal route, you can either turn right along the Fairbottom Branch or continue straight ahead to Crime Lake and Hollinwood.